Traveling abroad for a vacation sounds like an amazingidea until the moment you start organizing the trip and planning the details. That’s where many tourists get frustrated as it becomes quite hard to decide which places are worth visiting and how to fit everything into your schedule which is very often time limited. For that reason, many tourist agencies organize tours to help tourists get the most from their trips. Tourist agencies often offer escorted tours or private tours, depending on your preferences, whether to travel with a group or to have a private guide for yourself. If you are interested in traveling with a group, here are some basics you need to know before you choose this option. Escorted tours are essentially group tours to a destination. Travel agencies offering escorted tours plan all of the details of the tour - flights, transportation, hotels, etc. Escorted tours are executed by a tour director who travels with the group throughout the tour and ensures that it goes as planned and that the clients have someone that can take care of any issues that arise. They provide the customer service on site. Who goes on escorted tours? People who often decide to join an escorted tour are those who prefer to travel in a group and do not seek that much privacy. They love to make new friendships with the people they meet on their trip. They love to be carefree in terms of organizing and planning so they can enjoy a trip as much as possible. They prefer having someone providing them information about the visited place and learning about its history rather than studying details alone (due to the lack of free time to do so or some other reasons). The tour guides are often government certified, extremely knowledgeable, well-trained and experienced individuals who make sure all the people in the group enjoy their visit to a place, provide information about the visited site and talk to the tourists and answer their questions if they have some. They are outgoing, empathetic persons with great humor and communication skills, and passionate about their job. What is included in escorted tours? 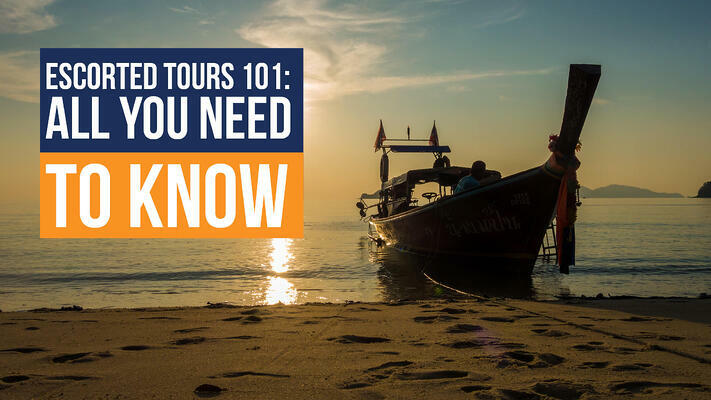 If you choose an escorted tour for your next trip, these are the things you can usually expect to be included: transportation, flights, transport to/from the airport and hotel, sightseeing and most meals. Compared to private tours and self-planned tours, escorted tours are mostly cheaper and you have a chance to see other places you wouldn’t be able to see if travelling on your own. What kind of hotels do you stay at? Accommodation depends on the tourist agency. Some of the agencies offer luxurious hotels, while others offer basic accommodation. It greatly depends on the price of the tour. If the luxurious hotels are included, then expect the price of the tour to be a bit more expensive compared to those that are cheaper. The cheaper the price of the tour the less luxurious accommodation you can expect. What about the meal options? When it comes to the meal options, most meals with the group are included. You can expect to try local food and tourist-friendly food in many restaurants. Depending on a tour, you may have some extra free time on your own and therefore all meals might not be included. If interested, you can explore the local cuisine or look for more international restaurants or spend the time according to your other preferences. A travel itinerary is a document which tells you how the trip is planned, including destinations that are planned to be visited, how you’ll get there, and how long you will be staying. You can study the itinerary as you look into the tour, to learn if it is the best one for you. All agencies make sure to post it on their website. Study it thoroughly, and make sure to be wary of itineraries that don’t go into much detail, or tell you what’s included, and what isn’t. Also, pay attention to the wakeup time, as some tours will take place early in the morning. How much activity is involved? Activity depends on a tour. Senior tours or senior friendly tours are more relaxed and leisurely. Those designed for younger tourists can include hiking, long walks or some sport activities if interested. What about deposit and cancellation policy? Many tourist agencies require payment in advance, or at least some percentage of it. The cancellation policy also varies. It’s important to check the details with the company before booking a tour. In case of an emergency, you will want your money back. Also keep in mind that most reputable agencies offer travel insurance which is a good idea to purchase in the event you need to cancel for any reason! If you want to choose an escorted tour for your next trip, check the schedule, itineraries and payment so you know what to expect. What you also need to be aware of is the excursions that are not included in the price. Make sure to be familiar with all the details so you can prepare better for your vacation and avoid any inconvenience.